The CAMRA Durham Real Ale Trail was launched at Ye Old Elm Tree on Crossgate, on July 28th, 2011. It was created by branch members Nick Young and Bob Chapman, with the assistance of the city centre pubs. 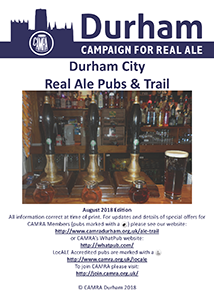 The trail was developed mainly to provide visitors to Durham City with information on where to find locally-produced real ale. Originally the trail was a single sheet and suggested a walking route of 10 pubs with descriptions and then listed the other real ale pubs within the city centre. In August 2016 an update was published as an A5 booklet which lists all 24 real ale pubs in a suggested order (although leaves the reader to decide which pubs they wish to visit). The new format has also allowed us to include descriptions of all 24 real ale pubs as well as giving details of the 2 real ale-serving clubs within the city centre. As of December 2018 we have also created a Bishop Auckland Ale Trail covering 11 real ale pubs in and around Bishop Auckland town centre. To download a copy of either guide, please click on the image of the relevant front cover to the right. If you spot any inaccuracies in the guides, please let us know by emailing webmaster@camradurham.org.uk and we will list any corrections on this page between updates. William Hedley (9) has now been renamed Three Bridges after a refurbishment, Its opening hours are 10-9 Sun; 9.30am-11 Mon-Fri; 9am-Midnight Sat. Three Bridges is also LocAle accredited. The New Inn (24) has now closed. We believe it is to be turned into a Flat White coffee shop Latest news is that it will remain a pub called White Church but with more of an emphasis on food and there will also be A takeaway coffee facility.